Welcome to Garabatos Spanish Preschool! We do have openings for 2019-20 at our flagship location (Boise Ave.) and our newly opened facility in the North End. To get on the list for 2019-20 or future years, please fill out the form by clicking on this link. Then, sign up for an upcoming tour. Preschool hours (for ages 3-5): 9:00 a.m. to 2:30 p.m. Students can be dropped off starting at 8:45 and must be picked up by 2:45. After-school care programs/fees (from 2:30 to 5:30) are listed below. Garabatos prepares all snacks for our students (with their help). 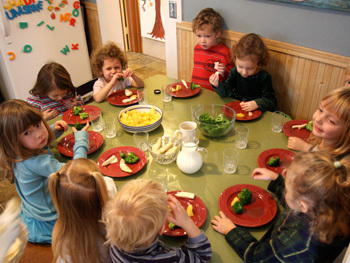 We serve healthy, nutritious foods that ensure your children are ready to learn. Offerings include mango, pineapple, brown rice, carrots, kiwi, and produce from the Garabatos garden. We never serve juice or any sugar-based drinks; water and soy/almond/coconut milk are available. Enrollment materials and forms are available by calling 336-1552 or by using our online contact form. We are currently taking reservations for the 2019-120 and 2020-21 school years.